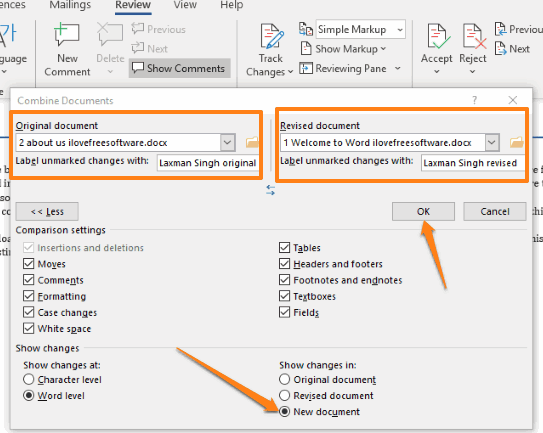 This article covers how to merge Word documents to create a single Word file. This can come in handy when there is an original Word file and a modified Word file and you want to compare the changes between original and modified file, and then finally create a single file from both the files, including the changes. To do so, you can use the native feature of Microsoft Word, which is available in Word 2007-2016 and Word 365. 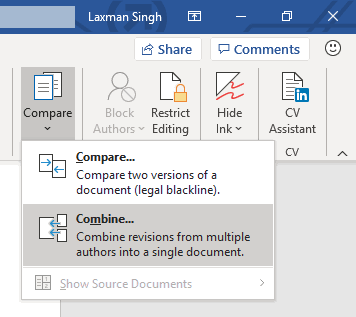 To merge two Word documents to create a single Word file, there is a Compare feature. 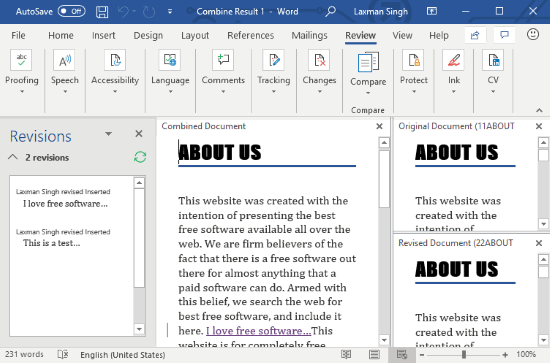 Using that feature, you can add the original and modified version Word files, view or compare the changes, preview the combined Word document, and then finally save the new combined document as a separate Word file. The screenshot above shows two Word documents combined and the output document is visible on the center part of Word. How to Merge Word Documents to Create a Single Word File? Step 1: Firstly, open Microsoft Word and then open the original Word document file. Step 2: Once you’ve done that, go to Review tab in ribbon menu, use Compare drop-down option, and tap on the Combine option. Original document: Here, add the primary document. You must also give a name, in ‘Label unmarked changes with box‘ like “original” or anything else to that document. This will help you recognize that this is the original document. Revised document: Here, you need to add the modified or edited Word file of the original file. Also, make sure “New document” radio button is selected under More menu in the same box. Step 4: Now you will come to the main interface of Word. Here, you will see four sections, as visible in the first screenshot. The left section shows the number of revisions or changes available in the modified document, the middle section shows the combined document, the top right section shows original, and the bottom right section shows the modified document. Look for the changes carefully. If everything is good, you can save the new document that will merge original and modified Word document. Did you know you can also use line focus featured in MS Word? Though you can anytime copy a Word document and paste that document in some other Word document, it won’t be helpful when there are changes in between the two documents. You won’t be able to add changes at the exact places. Therefore, this built-in feature is indeed helpful. You will be able to review the changes and then generate a merged Word document.